Branchio-oculo-facial syndrome (BOFS), a rare, multiple-malformation congenital disorder, is characterized by facial anomalies, including associated cutaneous and ocular abnormalities. 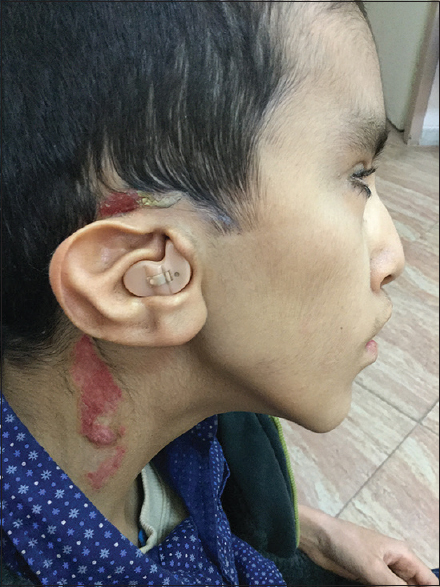 We report a new case of BOFS in an 11-year-old male child with bilateral cervical erythematous scaly linear plaque associated with scar formation and erosion. Although BOFS is very rare, physicians, especially dermatologists, should be aware of the cutaneous and histopathological features of BOFS due to impacts of the associated anomalies. Branchio-oculo-facial syndrome (BOFS) is a rare congenital disorder that is apparent at birth. Few cases of BOFS had been reported in the medical literature. The acronym BOFS was coined for the spectrum of signs: B, branchial arch anomalies; O, Ocular findings; F, facial anomalies. BOFS has variable cutaneous clinical features and remains a challenge to dermatologists. These cutaneous manifestations can vary from Keloid-like and scar-like lesions to eroded, unepithelialized skin., In some cases, this skin defect manifests as hemangiomatous lesions., Very little data exist regarding the histopathological descriptions of cutaneous lesions in BOFS. 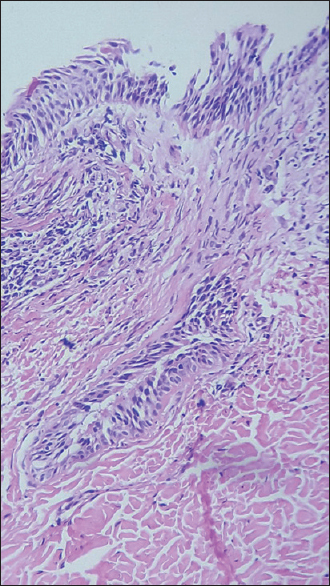 This report provides the clinical and histopathological description of a case of BOFS associated with bilateral cutaneous erythematous scaly linear lesions, highlighting the importance of detailed clinical and histopathological evaluations to provide accurate diagnoses and management, because sometimes these dermatological manifestations can be the clue to diagnosis. Furthermore, we emphasize the importance of a multidisciplinary approach in the diagnosis and management of BOFS patients. 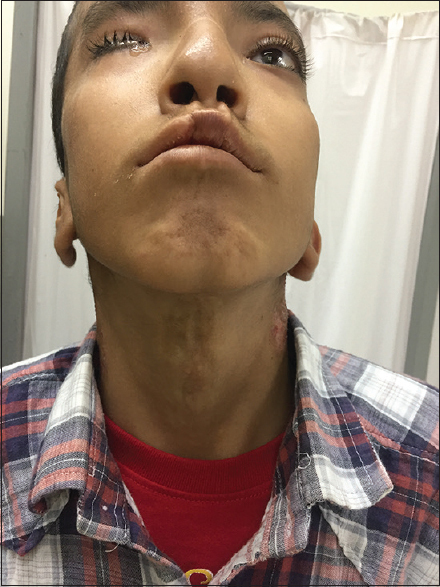 An 11-year-old Caucasian male child was referred to our department with a chief complaint of congenital, bilateral, erythematous scaly skin lesions on his neck. He was a full-term birth from an induction ovulation pregnancy delivered naturally. At birth, multiple anomalies had been noted. A high-resolution karyotype revealed a normal male karyotype of 46, XY. No cases of deafness, renal diseases, branchial fistula, or craniofacial anomaly were reported in the patient's family. 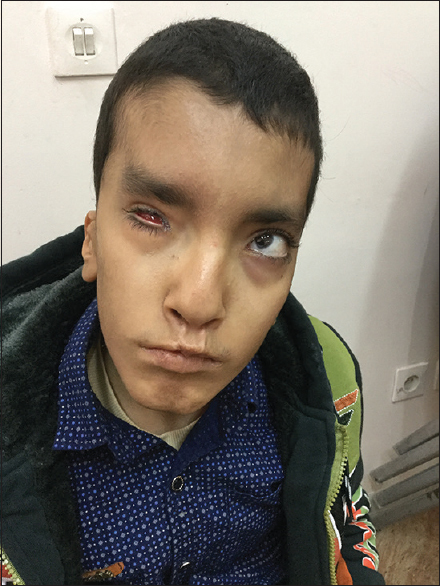 Craniofacial anomalies included bilateral cleft lip; low-set ears; broad bridge of nose; microphthalmia-associated ocular disorganization and primary vitreous hyperplasia in the right eye; and cataract in the left eye. The patient had a history of congenital hearing impairment and craniofacial anomalies at birth. At the same time, ocular anomalies were discovered [Figure 1]. At the age of 2 years, he underwent a corrective surgery of the lip palate. At the same time, he developed a seizure, but the cognitive and developmental were in the normal limits. A physical examination revealed erythematous scaly lesions on both sides of the neck [Figure 2] and the peri- and supra-auricular areas along with hyperpigmented scar-like lesions on the anterior sides of the neck [Figure 3]. He had malformed low-set ears on both sides. His nose had a broad bridge and a flat appearance [Figure 1]. The rest of the physical examination of skin was essentially normal. Ocular sonography using a 12 MHz probe revealed complex dysplasia and incomplete development of the anatomical structure of the left eyeball consistent with persistent primary vitreous hyperplasia. The axial length of the eyeball was smaller than normal, with an Anteroposterior of 11 mm, consistent with microphthalmia. At the age of 10 years, he underwent cataract surgery for the right eye. He also had nasolacrimal stenosis in the right eye. In the brain magnetic resonance imaging, left parieto-frontal cortical sulci, fissure, and basal cistern were prominent. Renal ultrasound of the left kidney revealed multiple cystic lesions, indicating that the left kidney was nonfunctional. Urinary anomalies in the right kidney were not discovered at birth. Audiometric examinations at the age of 1 year showed bilateral, severe-to-profound sensory neural hearing loss that the hearing levels were 75–80 dB. A normal thymic shadow was identified by a chest X-ray. There were poliosis (<10 white hairs) on the scalp examination and small bilateral canine teeth on oral examination. The nail examination was normal. Laboratory values at birth were within normal ranges, except for high serum creatinine and potassium level. 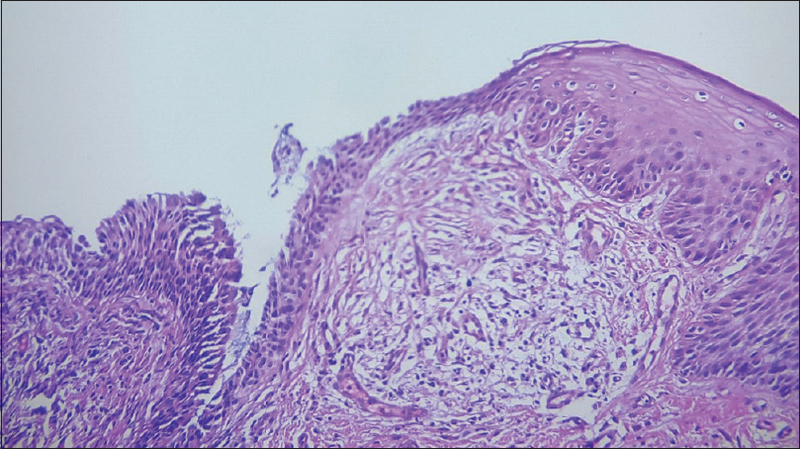 Histological examinations of skin abnormalities revealed that the normal epidermal squamous tissue was replaced by a ciliated respiratory epithelium [Figure 4], and in the upper dermis, an aggregate of lymphocytes reminiscent of a branchial cleft cyst was present [Figure 5]. Based on these clinical and histological characteristics, the patient was diagnosed with BOFS. Genetic counseling was recommended to the patient and his family, but the parents declined further evaluations. The expression of BOFS varies widely from one family to another and even among individuals in the same family. Moreover, the symptoms may vary from mild to severe forms with this disease. For these reasons, the diagnostic criteria for BOFS were established by a multidisciplinary group of specialists. Clinical diagnostic criteria for BOFS were formally proposed in 2011. In the absence of a family history of the disease, a clinical diagnosis of BOFS requires a person to meet either all of the major criteria or two major criteria and one minor criterion. The major diagnostic criteria for BOFS include branchial or cutaneous skin defects, ocular anomalies, and facial anomalies, including a characteristic facial appearance. The minor criteria include having an affected first-degree relative, independently diagnose, and ectopic thymus. Regarding the clinical criteria, our patients have three major criteria. In patients with BOFS, the first and second branchial arches do not develop properly, leading to abnormal patches of the skin, typically on the neck, or near the ears. Cervical or infra- or supra-auricular skin defects that vary from thin skin or hair patch to erythematous “hemangiomatous” lesions to large weeping erosions., These lesions differ from the punctuate sinus tracts of the branchiootorenal (BOR) syndrome. Our patient had bilateral, cervical erythematous scaly skin defects that were considered to be one of the major diagnostic criteria for BOFS. Many people with BOFS have malformations of the eyes that can lead to visual impairments. These abnormalities include microphthalmia, anophthalmia, coloboma, strabismus, ptosis, nasolacrimal duct stenosis or atresia, and cataracts. The characteristic facial appearance of BOFS can be seen in affected infants. Affected infants present with malformations of the head and face that include broad nasal bridge, malformed ears, tooth abnormalities, cleft palate and/or cleft lip, pseudocleft lip (prominent philtral pillars), and upper lip pits. Some patients show partial weakness of cranial nerve VII., BOFS can affect other structures and tissues as well. Some affected individuals have renal malformations, otologic abnormalities, and ectodermal abnormalities affecting their hair, teeth, and nails. Renal malformations can be unilateral or bilateral. These include dysplastic, absent, multicystic, and other structural anomalies, as well as vesicoureteral reflux. Otologic abnormalities found in most individuals with BOFS include hearing loss, such as conductive, sensorineural, and mixed varieties. They may also present with abnormalities of the pinnae, resulting in malformed or prominent ears, middle ear abnormalities, or inner ear abnormalities., Ectodermal abnormalities include premature hair graying (poliosis). Dysplastic nails and hypoplastic teeth abnormalities can also occur. Most of these features were found in our patient's case. In a small number of individuals, thymus gland tissue is abnormally located on the skin of the neck, which is known as dermal thymus. One of the most important findings in our case was brain anomaly and associated epilepsy. To date, in the literature, no cases of seizures associated BOFS have been reported in childhood. BOFS has almost complete penetrance. Careful examination of individuals identified in a family with BOFS is necessary to reveal subtle findings including premature graying, faint hair on the neck, or heterochromia irides. Although BOFS is rare, a high index of clinical suspicion is needed when a patient presents with clinical features, suggesting this diagnosis. Histopathological evaluations can provide additional details because sometimes these cutaneous, clinicopathological manifestations can be a clue pointing to a correct diagnosis. Lee WK, Root AW, Fenske N. Bilateral branchial cleft sinuses associated with intrauterine and postnatal growth retardation, premature aging, and unusual facial appearance: A new syndrome with dominant transmission. Am J Med Genet 1982;11:345-52. Milunsky JM, Maher TA, Zhao G, Roberts AE, Stalker HJ, Zori RT, et al. TFAP2A mutations result in branchio-oculo-facial syndrome. Am J Hum Genet 2008;82:1171-7. Misceo D, Bjørgo K, Ormerod E, Ringen Ø, Rocchi M, van der Hagen CB, et al. A de novo 6p interstitial deletion and a complex translocation involving chromosomes 2, 6, and 14 in a mildly developmentally delayed patient. Am J Med Genet A 2008;146A:3230-3. El Darouti MA, Marzouk SA, Azzam OA, Nada HR, Sobhi RM, El Nabarawi I. Branchio-oculo-facial syndrome with bilateral linear scars of the neck. Int J Dermatol 2005;44:674-6. Vantrappen G, Feenstra L, Fryns JP. Conductive hearing loss and multiple pre- and supra-auricular skin defects: A variant example of the branchio-oculo-facial syndrome. Genet Couns 2000;11:273-6. Raveh E, Papsin BC, Forte V. Branchio-oculo-facial syndrome. Int J Pediatr Otorhinolaryngol 2000;53:149-56. Frascari F, Bieth E, Galinier P, Just W, Mazereeuw-Hautier J. Branchio-oculo-facial syndrome. Ann Dermatol Venereol 2012;139:550-4. Milunsky JM, Maher TM, Zhao G, Wang Z, Mulliken JB, Chitayat D, et al. Genotype-phenotype analysis of the branchio-oculo-facial syndrome. Am J Med Genet A 2011;155A: 22-32. Morisada N, Nozu K, Iijima K. Branchio-oto-renal syndrome: Comprehensive review based on nationwide surveillance in Japan. Pediatr Int 2014;56:309-14. Lin AE, Yuzuriha S, McLean S, Mulliken JB. Lesser forms of cleft lip associated with the branchio-oculo-facial syndrome. J Craniofac Surg 2009;20 Suppl 1:608-11. Shabbir AQ, Nazareth MR, Rothman IL. Branchio-oculo-facial syndrome presenting with concomitant thyroglossal duct cyst. Pediatr Dermatol 2012;29:383-4. Trummer T, Müller D, Schulze A, Vogel W, Just W. Branchio-oculo-facial syndrome and branchio-otic/branchio-oto-renal syndromes are distinct entities. J Med Genet 2002;39:71-3. Tekin M, Sirmaci A, Yüksel-Konuk B, Fitoz S, Sennaroğlu L. A complex TFAP2A allele is associated with branchio-oculo-facial syndrome and inner ear malformation in a deaf child. Am J Med Genet A 2009;149A:427-30. Ozturk O, Tokmak A, Demirci L, Silan F, Guclu E. Branchio-oculo-facial syndrome with the atresia of external ear. Int J Pediatr Otorhinolaryngol 2005;69:1575-8. Lin AE, Gorlin RJ, Lurie IW, Brunner HG, van der Burgt I, Naumchik IV, et al. Further delineation of the branchio-oculo-facial syndrome. Am J Med Genet 1995;56:42-59. Hiroshi F, Satoru S, Eisuke U, Kunihiro K, Yuhei Y. Bilateral dermal thymus of neck in branchio-oculo-facial syndrome. J Plast Reconstr Aesthet Surg. 2006;59:1385-7. Lin AE, Haldeman-Englert CR, Milunsky JM. Branchiooculofacial syndrome. In: Adam MP, Ardinger HH, Pagon RA, Wallace SE, Bean LJ, Stephens K, et al., editors. GeneReviews((R)). Seattle (WA):University of Washington, Seattle; 1993-2018. ISSN:2372-0697.